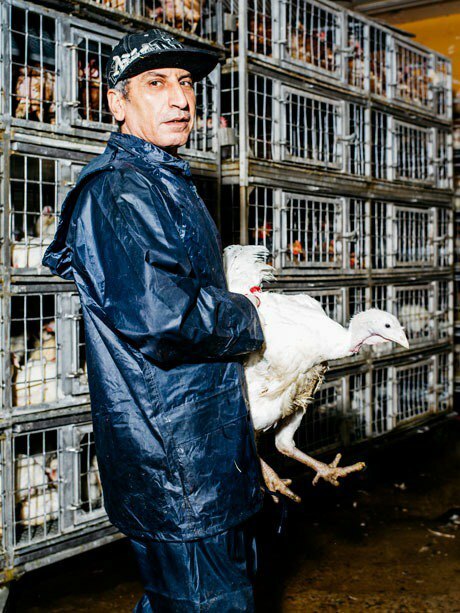 Over 80 live poultry markets quietly thrive in NYC, with a clientele made up mainly of the city's immigrant populations. Hopes&Fears took a trip to a Brooklyn slaughterhouse to go behind the scenes. Every once in awhile, you’ll be walking along a city block in the summer, only to be hit by an odor somewhere between an unearthed catacomb and a livestock show. This would be one of the city’s many live poultry markets, unobtrusively occupying storefronts alongside restaurants and nail salons. 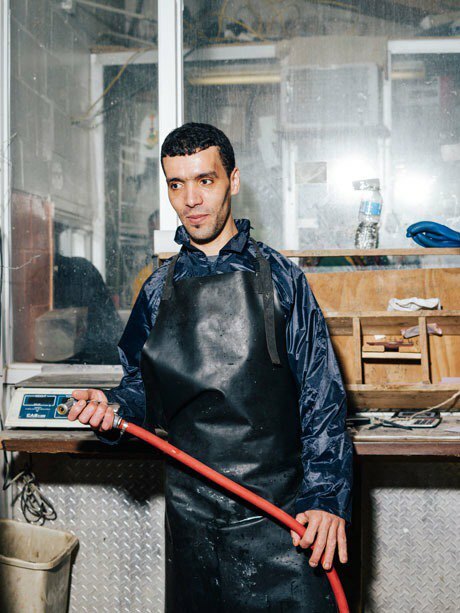 The air at Brooklyn’s Saba Live Poultry isn’t vile, not enough to make a city block aware of its presence, but it has a pungency and weight—a heavy blanket coating the air with a steely bleach smell occasionally cutting through. I tell the manager, Mohammad Mused, that I’m surprised it doesn’t smell worse, and he assures me this is because they’re cleaning, Cloroxing, and spraying constantly. 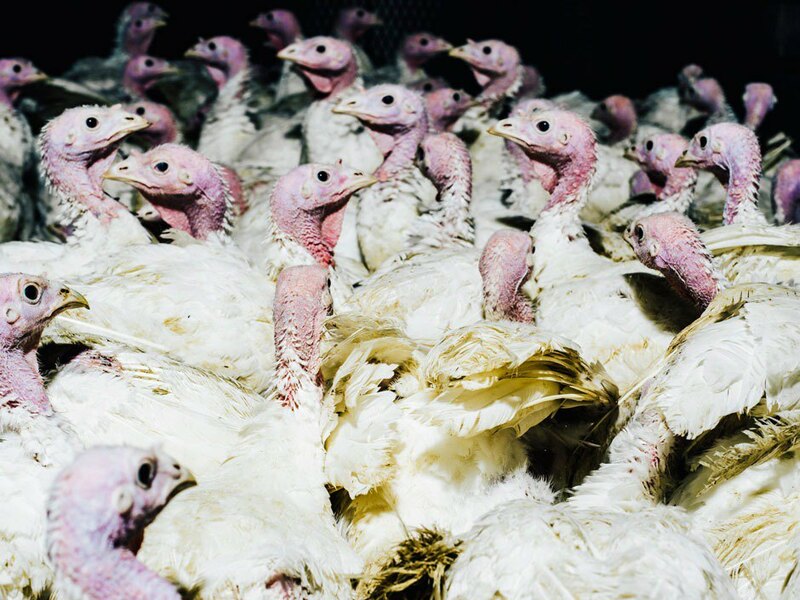 Turkeys ready to be sold at Brooklyn's Saba Live Poultry, November 22, 2015. 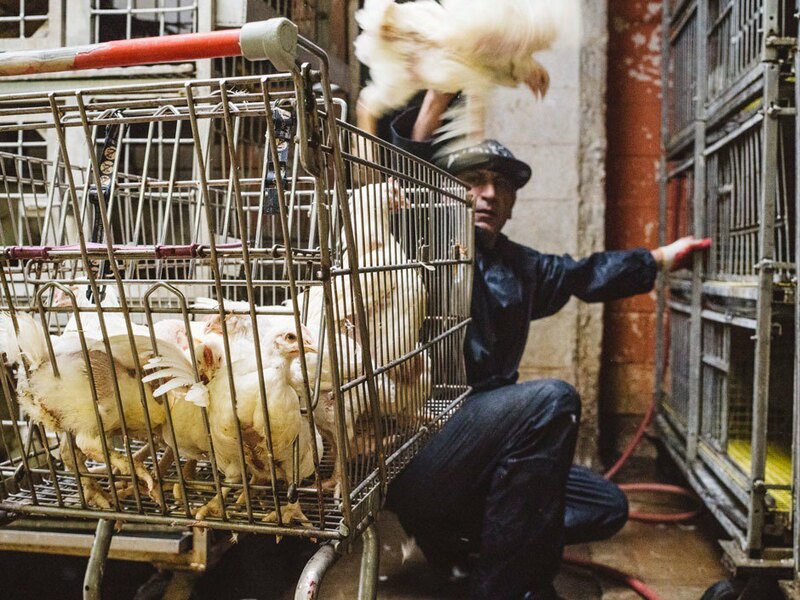 These live poultry markets and slaughterhouses are not pretty—no one, especially in the supermarket culture here in the U.S., really wants to look their dinner in the eyes—and surrounding residents aren’t thrilled about having to live by them. It’s difficult to find a market willing to be interviewed, which is somewhat understandable considering a lot of people don’t want them around. 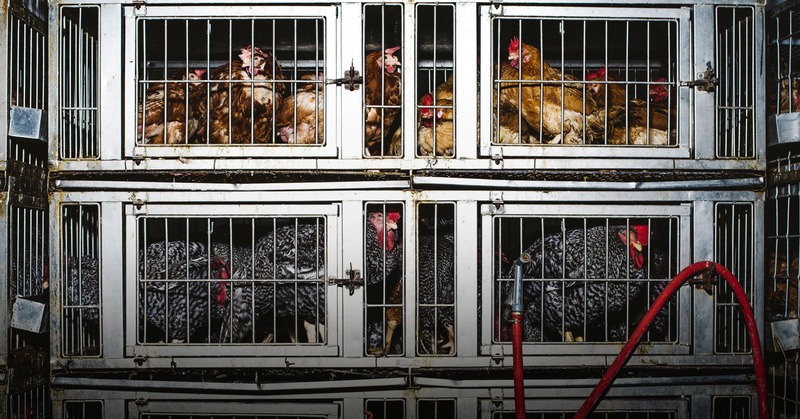 Animal rights activists don’t like the way the animals are transported and treated, residents don’t like the smell, and doctors warn against the dangers of avian flu. In 2012, Governor Andrew Cuomo and the New York legislature passed a bipartisan four-year moratorium on the licensing of any new live animal slaughter markets within 1,500 feet of a private residence. Saba is off the last stop—Canarsie/Rockaway Parkway—on the L. It’s a quiet few blocks, only a Public Storage business and a few semi-vacant body shops surround it. A rather large (and according to Mused, rather expensive) statue of a chicken stands erect, chest puffed out, outside the market. They’re not trying to disguise their presence. 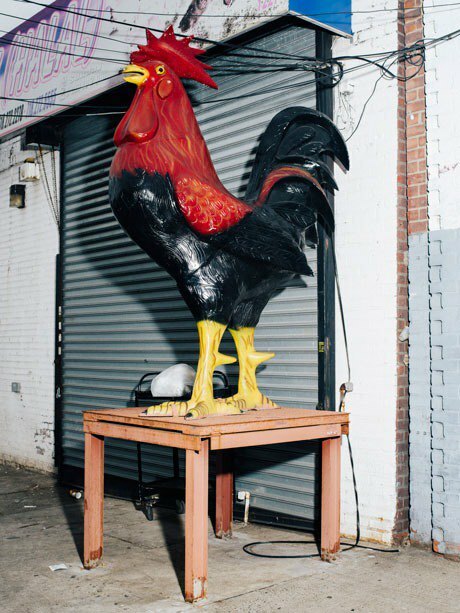 In spite of over 80 live poultry markets in New York City, most public sentiment towards them seems to be either vehement disgust or obliviousness, with people simply wondering what the bad smell is when passing by certain blocks. 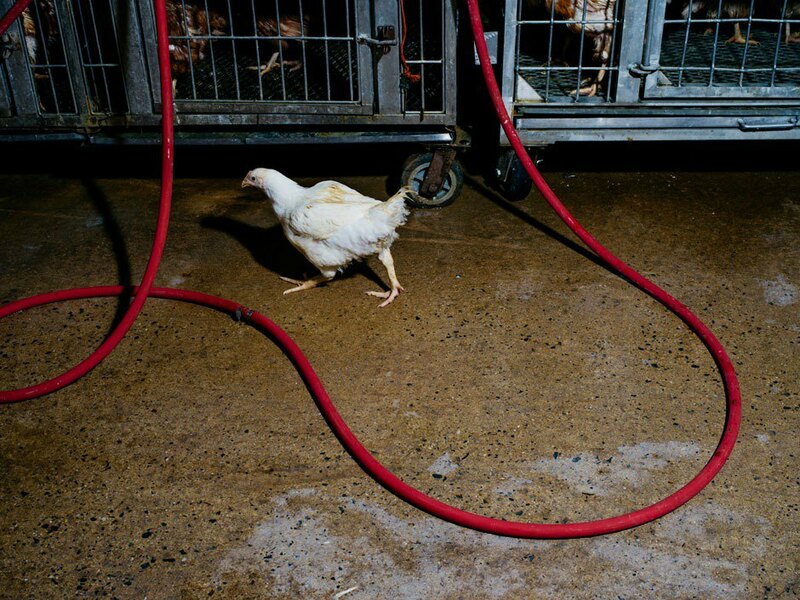 They’ve proliferated in recent years, and New York is known as having the largest number of live poultry markets in the United States. 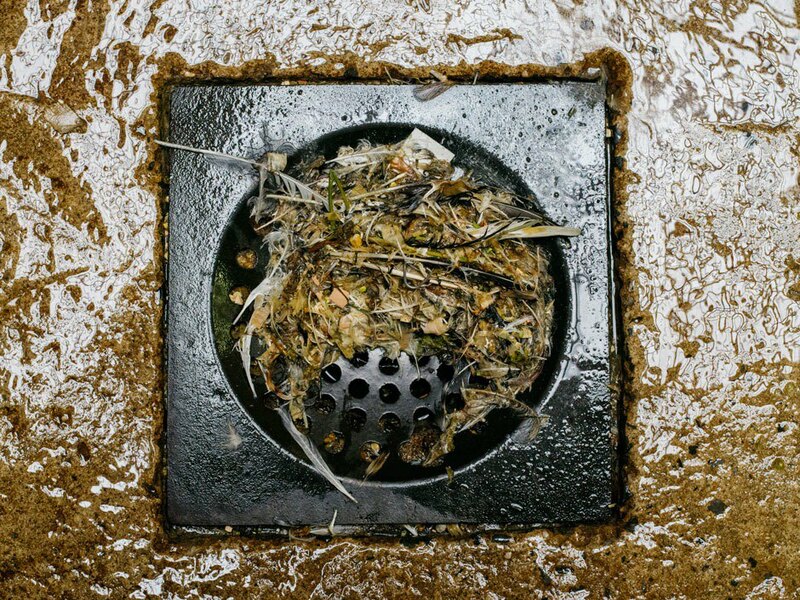 A 2012 estimate put annual sales of birds in New York somewhere between 12 to 17 million per year. Mused isn’t surprised people were hesitant to take our calls. “They’re probably scared that you’re trying to investigate them, but we have nothing to hide here,” he says with a shrug. A Saba employee puts chickens in the cages that line the store area. A significant part of Saba’s clientele comes from Muslims looking for poultry prepared according to the rules of halal. This means that the slaughter must be performed by someone who is Muslim, who must bless the animal before it’s killed by cutting its throat and draining the blood from its veins. Mused explains that, though you have to believe in God, one can also be Christian or Jewish, as well, because “they both believe in God, and when we kill we all sacrifice to the same person.” It’s one thing to pick out your chicken breasts—already disassociated from a living, breathing thing—in the aisles as top 40 music plays over store speakers. It’s a bit more sobering to see what will become your set of chicken breasts try to make a run for it from the plastic bucket attached to the scale. 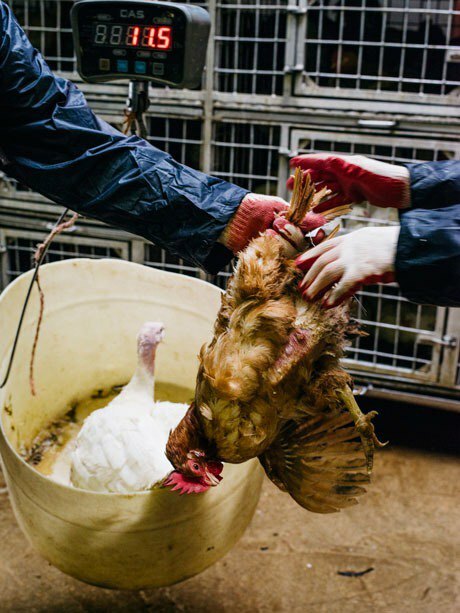 Seeing this in your own backyard isn’t pretty, but one would imagine the life of a chicken bred by Tyson or Perdue isn’t much different, and at least it’s closer to home. In a 2012 press release, Patrick Kwan, then New York State director for the Humane Society, said “The last thing New Yorkers need is more of these bloody, dirty and inhumane storefront slaughterhouses, especially where we live, eat and sleep.” This might be true, but also presents a bit of a cultural catch-22. If New York’s immigrant populations, who define many of the city’s neighborhoods, call for their meat freshly slaughtered and prepared in front of them, what’s the alternative? The idea of taking a two hour train trip out of the city seems to defeat the purpose. In 2012, bill A.9158/S.6383 extended the expiring 2008 state law banning the licensing of any new live animal slaughter markets within 1,500 feet of a private residence. In January 2012, Japan banned imports of all poultry from New York state after discovering two cases of low-pathogenic avian influenza from a Brooklyn live animal market. left A Saba employee sprays down the floors of the market's main area. right A customer's order is weighed for purchase. A Democratic assembly member from Queens and a Republican senator from Mineola worked together to pass the moratorium on live animal markets. One of the main reasons cited by politicians and health experts is the danger of spreading H5N1, otherwise known as bird flu. All poultry imported into New York requires a certificate of Veterinary Inspection or a specific USDA form called a USDA VS Form 9-3. It also must meet three requirements: birds must be from a source flock from which 30 birds were tested negative for avian influenza with 10 days prior of entering the state, be from a flock that has been certified in its home state as an “Avian Influenza Monitored Flock,” or from a National Poultry Improvement Plan-approved flock. One of the chickens makes a run for it. Markets must comply with a long list of sanitation requirements, ranging from how the killing, eviscerating, and packing rooms should be separated, to what angle the window sills should be sloped to. The reluctance with which many markets answered phone calls gave me the sense of a food inspector performing a sting operation. Mused was fairly open about demonstrating each stage of the process, from throat-slitting to packaged meat sliding across the counter to a customer. A customer first picks out the bird he or she is looking for, at which point it’s weighted in a plastic bucket dangling from a scale. The bird is then taken to the back (sometimes while squawking, not for the faint of heart) and slaughtered. Then, the carcass is boiled, de-feathered, and taken to the next room to be cleaned and prepared. Minutes later, the customer walks out, package in hand. It’s the closest a New Yorker gets to either life back home–maybe in Haiti or India–or life on a Texas ranch, depending on your point of reference. 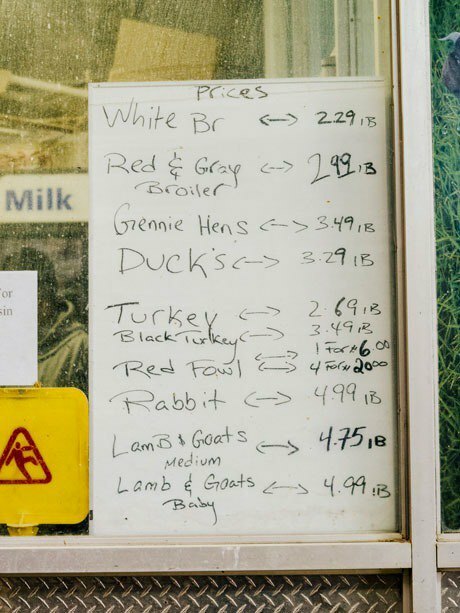 Left Daily market prices of poultry and livestock right Mohammad Mused Jr., manager of Saba Live Poultry's Rockaway branch. On a Sunday afternoon, only a few customers are milling around inside Saba. One man is taking a cell phone video of the chickens in their cages while laughing and narrating to his audience on the other end, and another woman is paying for her order. She walks up and asks, “Are you writing a story about this?” I say yes. “Do you eat meat?” Yes, I answer. She nods and walks off without saying another word. The air feels heavier the longer you’re in there; doing this work day in and day out would require a steely sensibility and a strong stomach. And, in the case of Mused, probably the knowledge that this isn’t just an industry he’s working in, but a family-run operation that sustains his extended family, as well.